Pudding. Afters. Sweet. Dessert. 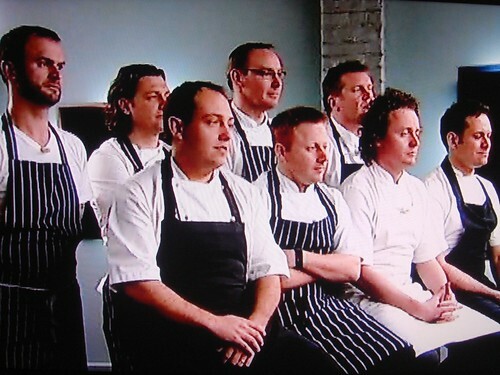 Call it what you will, but today is the last round of the Great British Menu 2009, and the last chance for the chefs to get into the final, and their challenge is to give us some sugar. Shaun Rankin has had such a bad week, he's come in early to bake several test tarts. 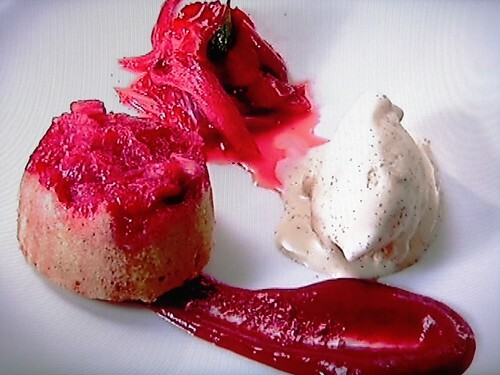 However, no-one has changed their desserts completely, though Danny admits to a good tweak. Danny Millar is in fact up first with his Rhubarb and Custard which he says "eats really well". I absolutely hate this trend of using "eat" as a passive verb - when someone says "my spaghetti eats really well", I want to reply "Nice that it has such an appetite". The rhubarb is sponge cake and the custard is ice cream; the latter is a touch too soft so Kenny Atkinson helpfully sprinkles some crumbled praline as a base to stop it sliding around. 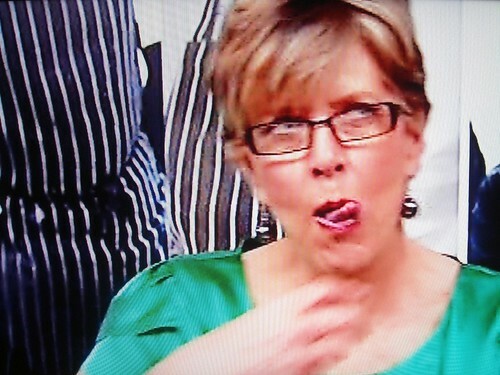 When it's brought in to the judges, Prue Leith exclaims "That's one hell of a tweak!". Oliver Peyton says though it looks better, overall it's poor and lacks cultural identity. Matthew Fort rather rudely says that it's the work of a "talented, earnest DIY specialist". Kenny Atkinson has the most ambitious dessert to offer. His stunning Strawberry Textures include chillied strawberry soup with sherbet, marinated strawberries, jellies, parfait, strawberry doughnut, popping candy and crumble. Returning the earlier favour, Danny Millar helps fry the doughnuts and inject them with jam - sadly Prue complains they're not jammy enough! Oliver complains that he expected greater traditional heritage, that it lacks personality and is all a bit "meh, meh, meh", but it "appeals to the Peter Pan" in Matthew Fort with its sense of fun. Prue Leith agrees that it invokes memories of childhood plus loves its gastronomic line-up. Tristan Welch is meant to be up next, but his imported electric cone maker decides to implode and, as he dismantles it desperately, James kindly offers to step into the breach and go before him. James Sommerin is making Summer Pudding, Honey and Lavender (the last item coming from his gran's garden). 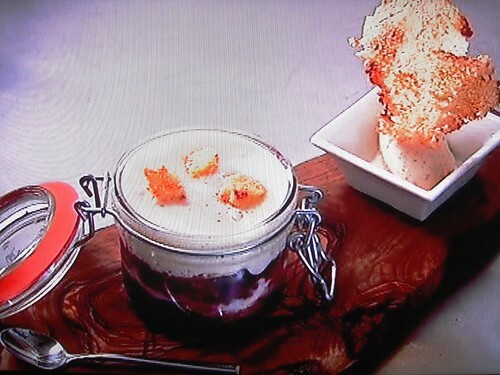 His pudding is more of a trifle with honey espuma and brioche croutons on top. 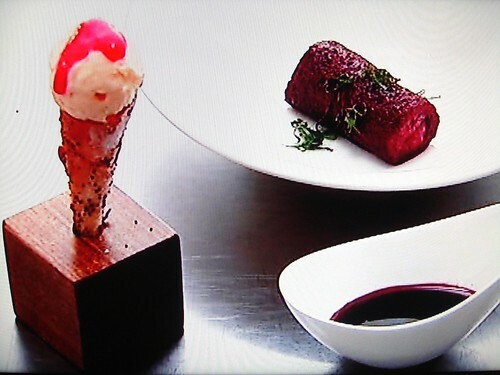 He also adds some ice cream and a brioche wafer. Oliver says it's "ten times better, a beautiful journey in a kilner jar". Prue says it "slipped down like a dream". But Matthew grumbles that the croutons are a sideshow distraction and not proper summer pud. Oliver says that it's in the language of summer pudding and Matthew gripes that if it is, it's Esperanto; it's just a "lazy, crazy summer pudding". Tristan Welch has abandoned the cone maker and is making rustic, hand-rolled cornets when an electrician returns with the appliance fixed. Tristan goes back to the maker, deciding it's more efficient. 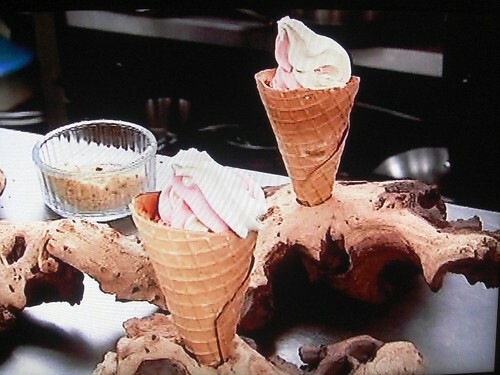 His dish is Rhubarb & Crumble Custard Ice Cream cone served in a piece of driftwood. He's popped a marshmallow in the bottom of each cone to please Matthew who was sorely disappointed not to find such a treat last time. All three judges are delighted by his efforts. There's more clarity; the custard is sweeter and "the rhubarb more rhubarbly" (sic Matthew Fort). Oliver says it's passionate and right and everyone will love it. Prue's a bit miffed though that there isn't praline crumbled on top, though she does like the marshmallow surprise. 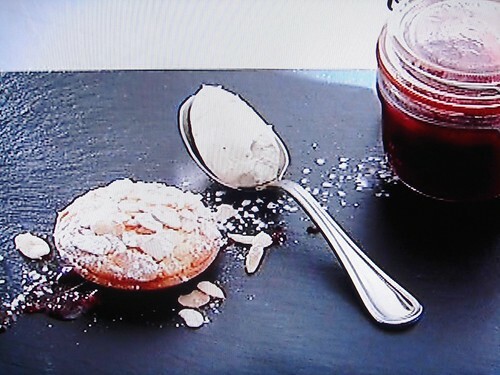 Nigel Haworth is next with the dessert they've all been dreading - Summer Fruit Pudding with a Cornet of Lancashire Cheese Ice Cream. 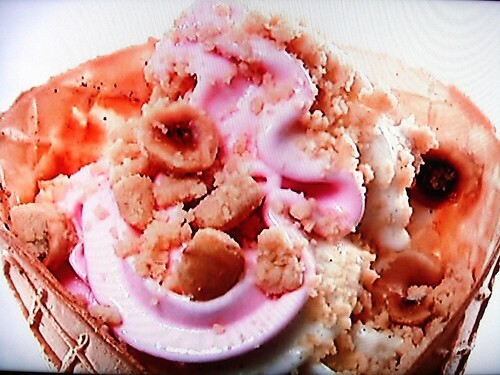 He's also inserted in each poppy-seed cone what Jennie Bond calls a "chocolate stick" - I guess Flake is trademarked. Each pudding is carefully glazed but looks like poo (polishing a turd, heh), and served in what looks like kidney dishes. Really not attractive. OP: "If that's the cheese ice cream I don't want it"
PL: "The pudding looks too gory, too much blackcurrant, too dense, not at all a pleasure to eat"
OP: "If this is summer pudding, I'm glad James Sommerin took it upon himself to move away from this f******g rubbish, it's foul; it's not a summer of love, it's a winter of discontent"
PL: "It's disgusting; seldom have I had a more disappointing dish; the cheese ice cream was quite horrible"
Glynn Purnell is next with his Bakewell Tart with Double Cream Ice Cream & Cider Brandy Fruit Jam (Glynn cooks the latter to order so Nigel dubs it instant jam). 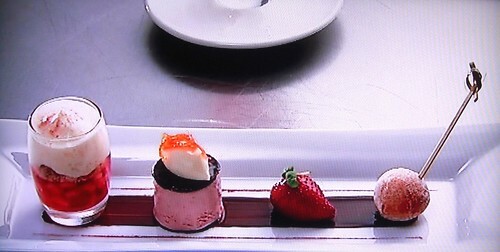 There's high hopes all round as Glynn won this course last year with an exquisite Strawberries with Burnt English Cream. Unfortunately the jam doesn't cool down enough, leaving the ice cream to melt and immediately get overwhelmed by the jam. Prue and Matthew are both disappointed, and Oliver says he's actually a little angry at Glynn for making something "slightly ill-conceived" when he was expecting a fantastic reinvention. 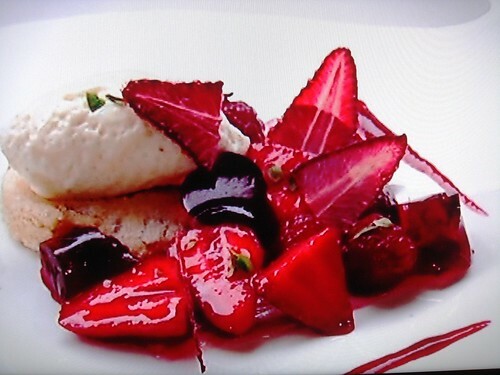 Tom Kitchin is presenting Highland Crowdie Cheesecake Mousse served with Summer Fruit Jelly and Berries. The mousse nestles on a piece of shortbread, and the whole dish sits on a bed of rhubarb carpaccio. The shortbread is beautiful, but Matthew quibbles that "though it's the distillation of a Scottish pudding, it's all very minor key". Prue disagrees saying it's pretty as a picture and more Chopin, but Oliver says "It's not rock & roll though, is it?" 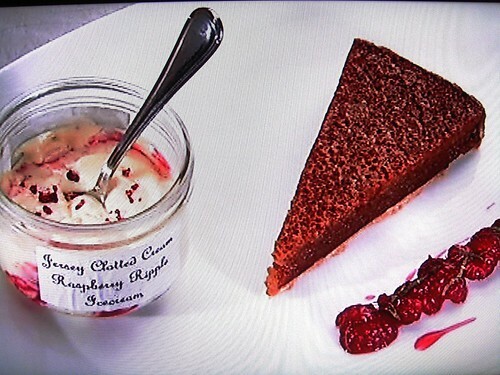 Finally it's Shaun Rankin with his Treacle Tart with Jersey Clotted Cream and Raspberry Ripple Ice Cream. 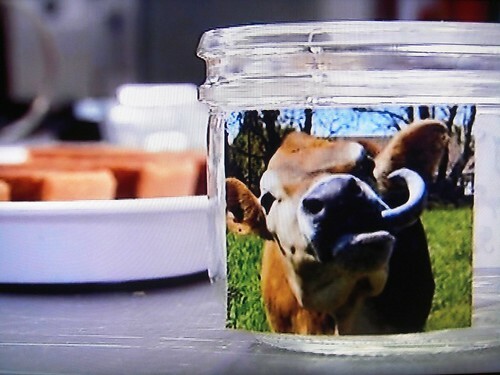 Desperate for some luck, he's printed out stickers with a lovely Jersey cow on them, to adorn the pots of cream (as well as his fellow chefs). Hurrah - luck and practice is clearly on his side, as Prue says she loves it and it's "the best treacle tart in the world". Matthew Fort says that it "takes high art to make it that good". "I would like to go round every major city and I would like to give everyone a sample of treacle tart and this clotted cream and say this is British food, because it is so beautiful, so high quality, so confident, absolutely perfect. The troops are going to go mad for it!" 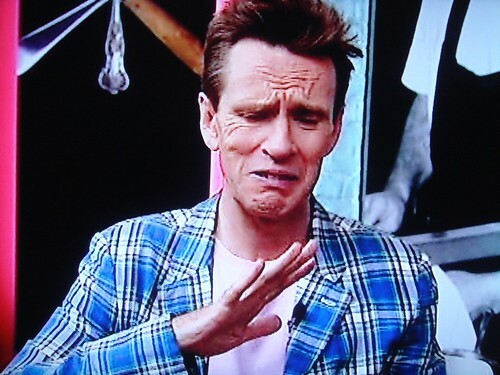 The mighty have fallen as Nigel has gone from first yesterday to last today (much like James Sommerin did). 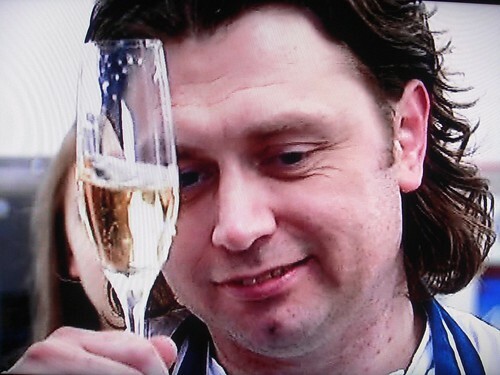 There's real emotion though as Shaun Rankin gets his long-awaited, well-deserved triumph.